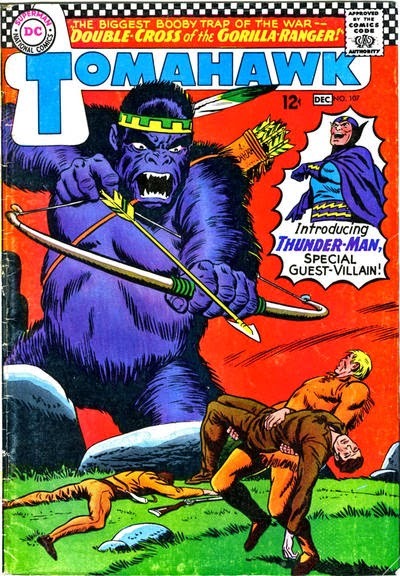 And being threatned by a giant gorilla with a bow and arrow. 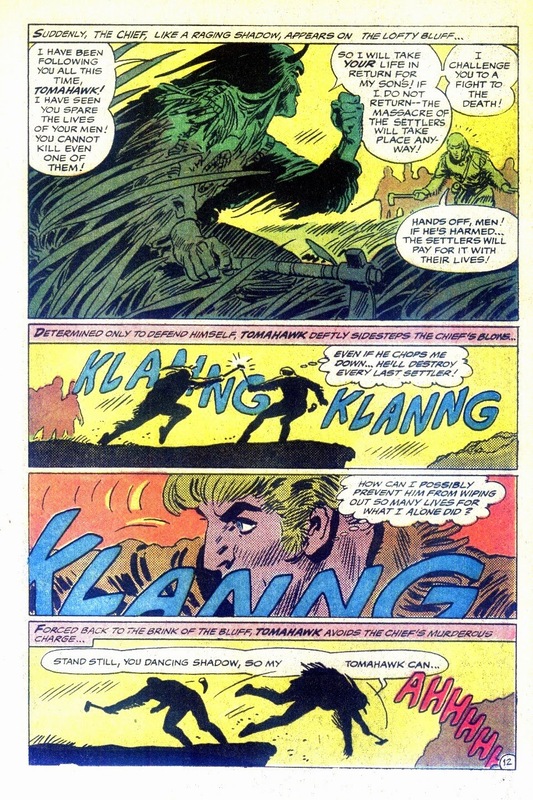 Actually, that's a new one on me, that one. 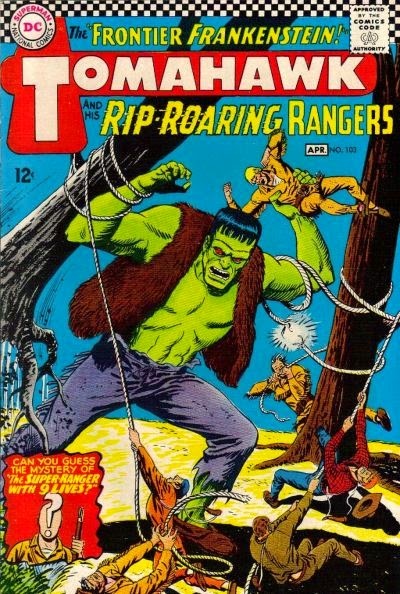 Then, in the Bronze Age, he got a little bit of a makeover. 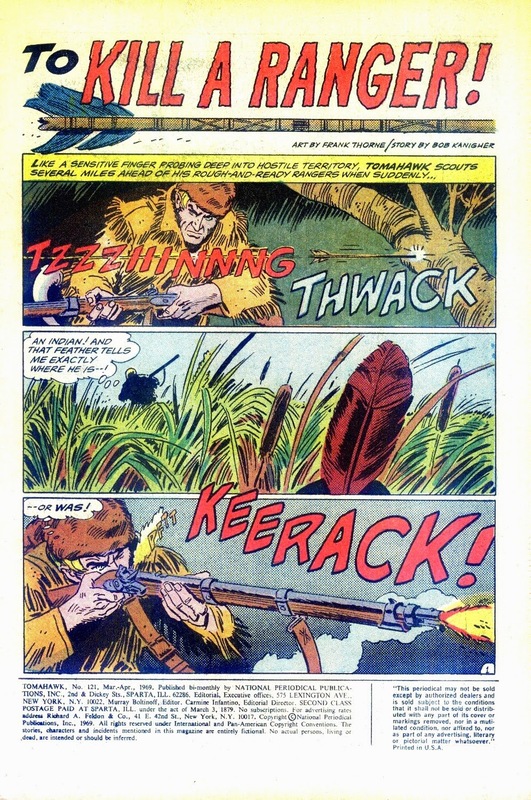 Bob Kanigher came in, and remembered this was supposed to be a western strip, not Supes & Bats bouncing around in World's Finest, Neal Adams contributed some new counter-culture covers that looked like outtakes from Soldier Blue, and Frank Thorne did some of the best work of his life. 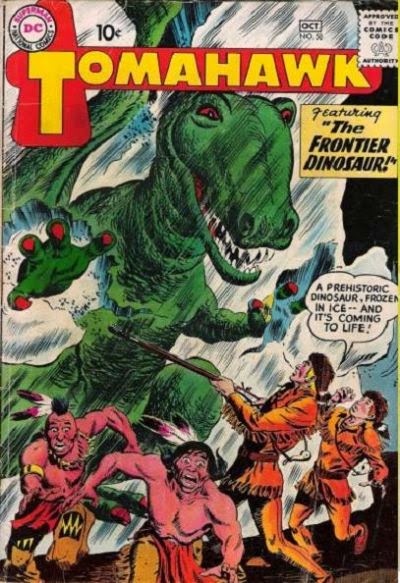 Ok, it's still DC pre-Jonah Hex, so no real surprises in the stories, but as Tomahawk protects the settlers of the Old West from constantly marauding Indians, alongside his Howling Commando's style buddies, one of whom seems to be an elf, it all feels properly authentic and right. 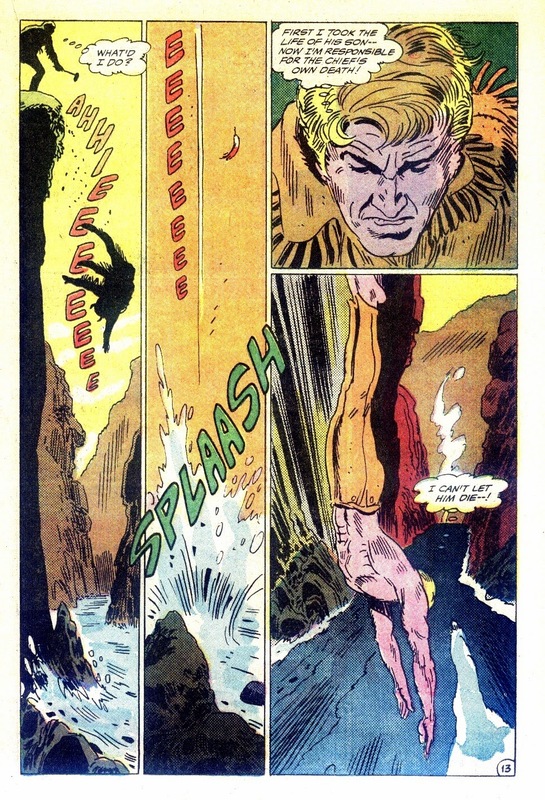 And Neal & Frank are on fire. 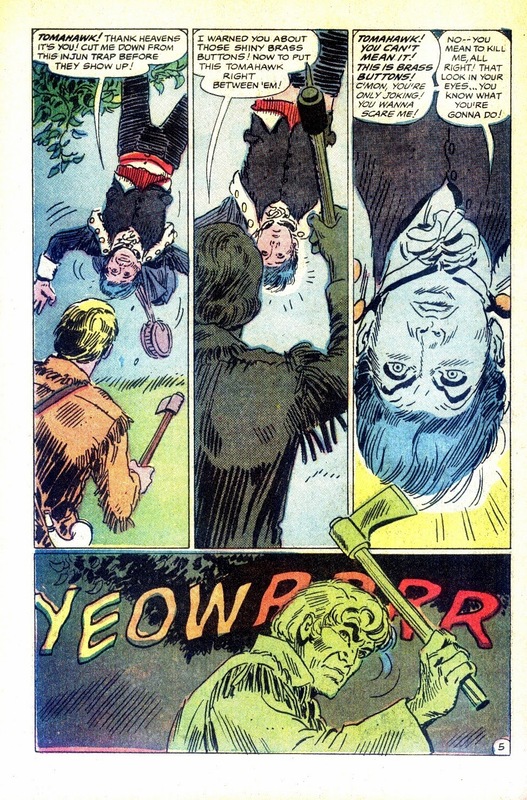 Tomahawk was unique in that it took place during the Revolutionary War in the late 18th century. 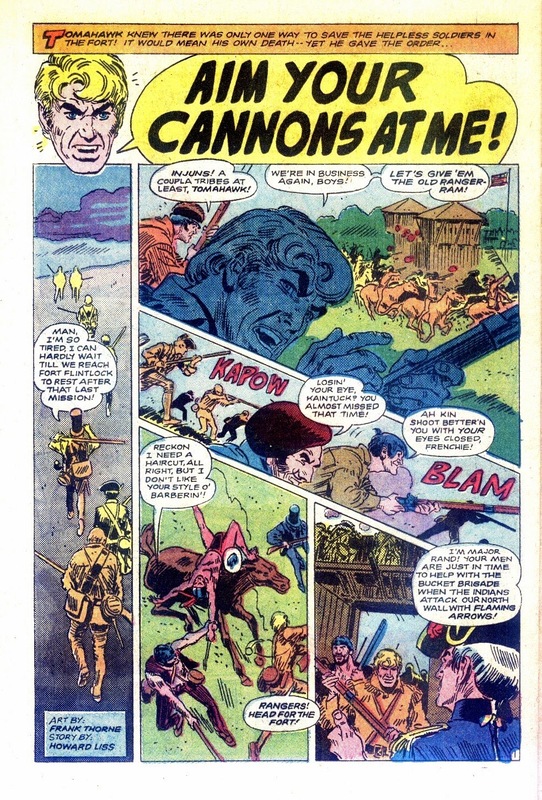 And it originated in Star Spangled Comics in the late 40's. 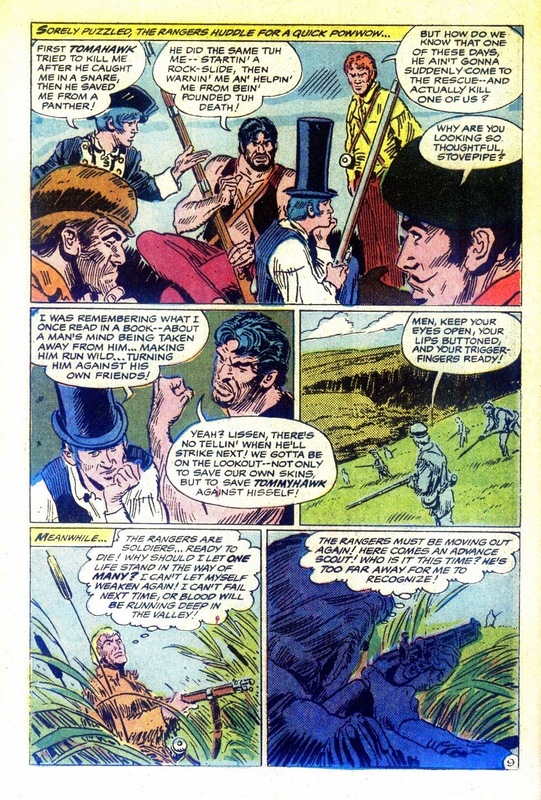 His buckskin outfit and coonskin cap seemed to be of a piece with the legendary Davy Crockett, who became a national craze when Disney made a TV series about him. 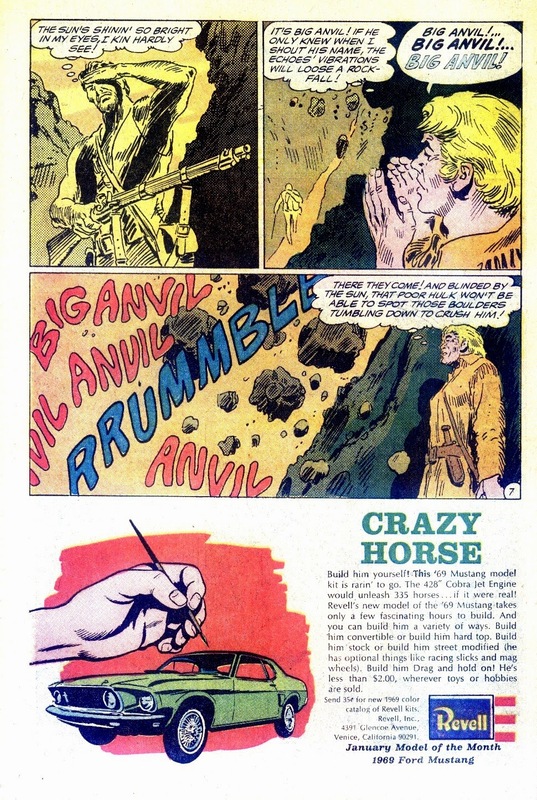 It may have been the first major licensing blockbuster on a scale that prefigures Star Wars. 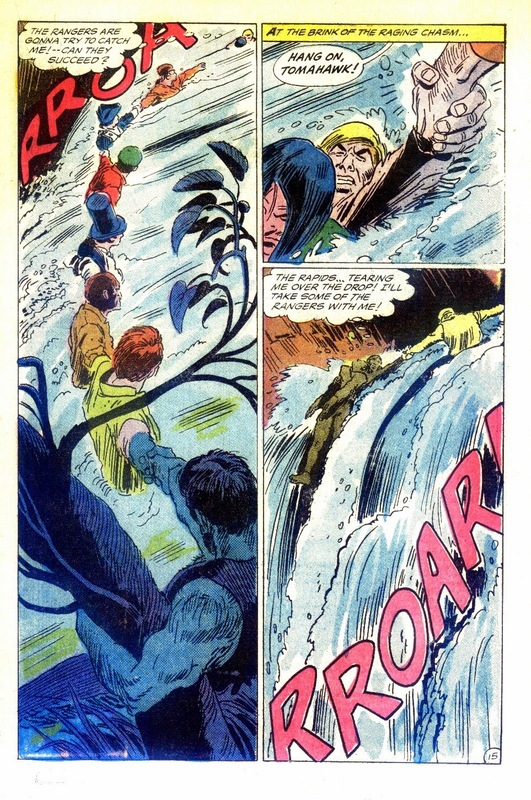 Kids everywhere were wearing that weird cap and the TV theme song was a mega-hit on the radio and in record sales. 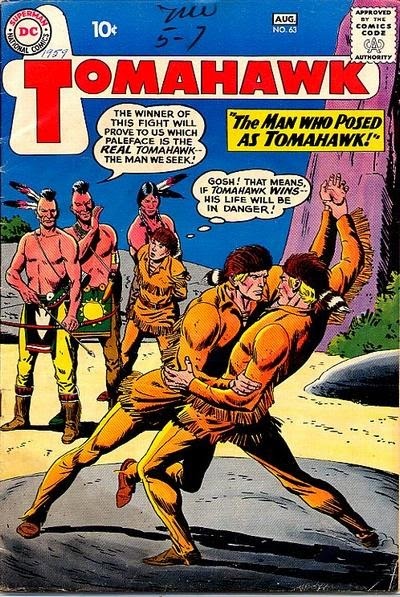 But Tomahawk actually predates the Disney show, though I bet he got a boost from the Crockett wave. 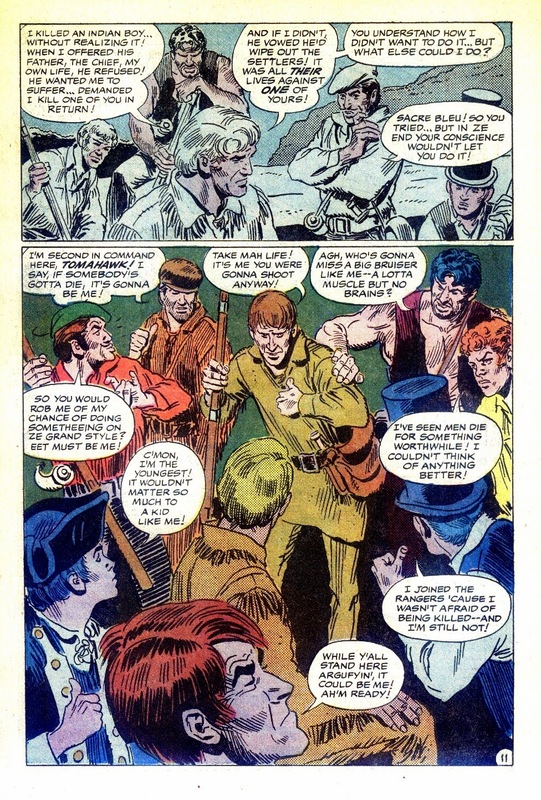 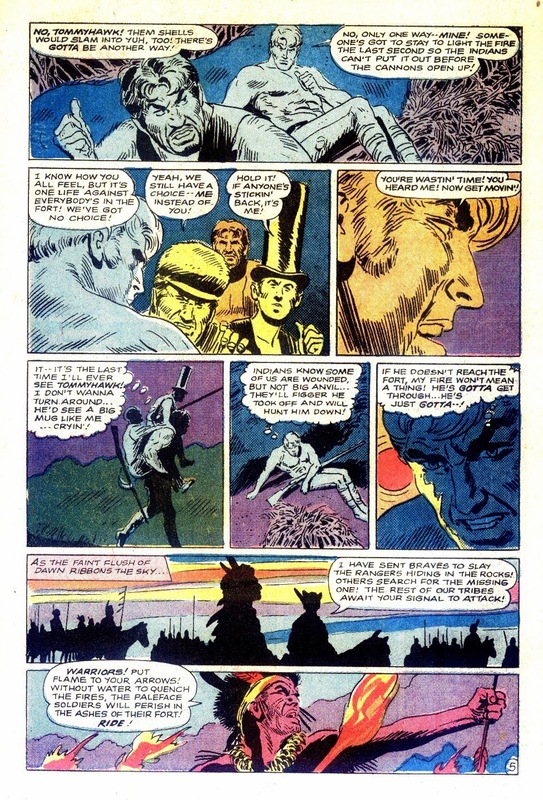 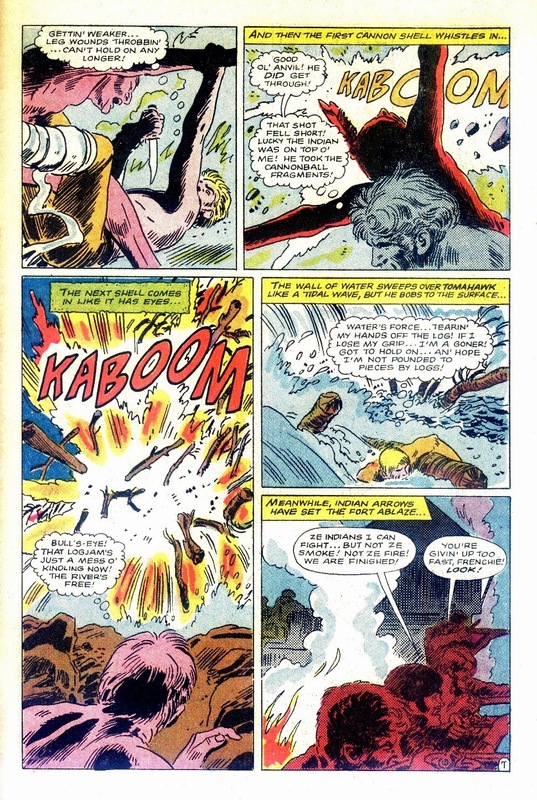 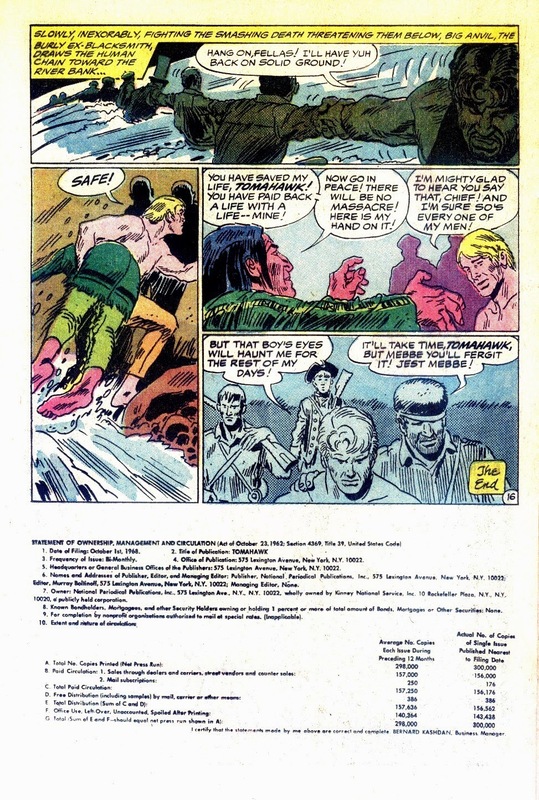 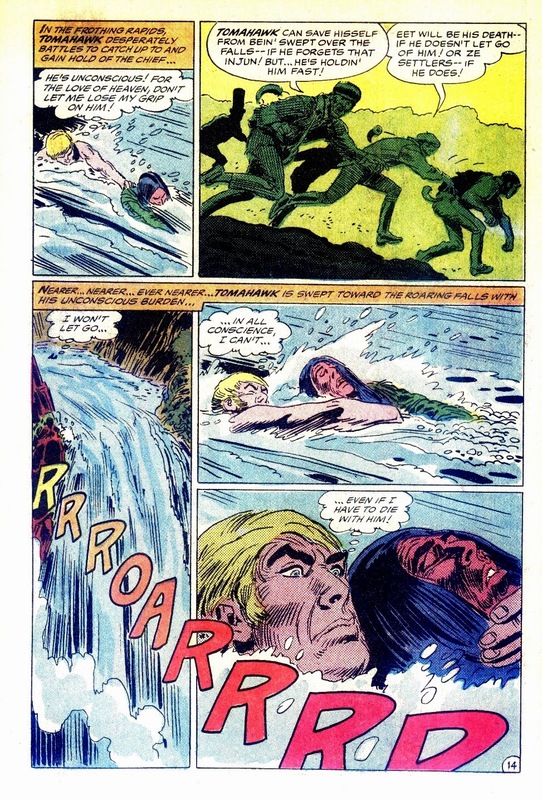 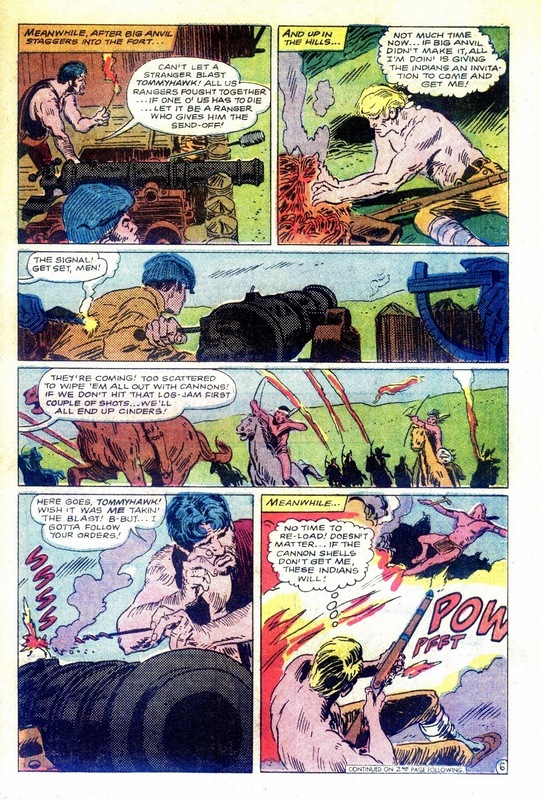 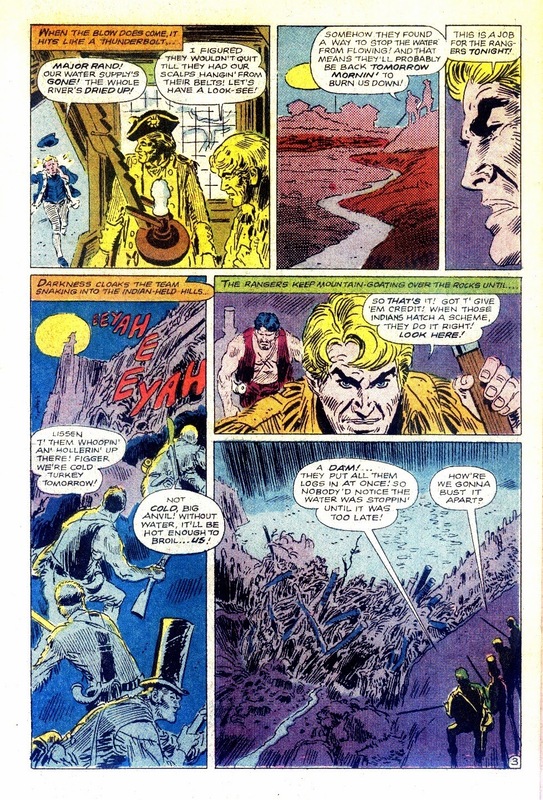 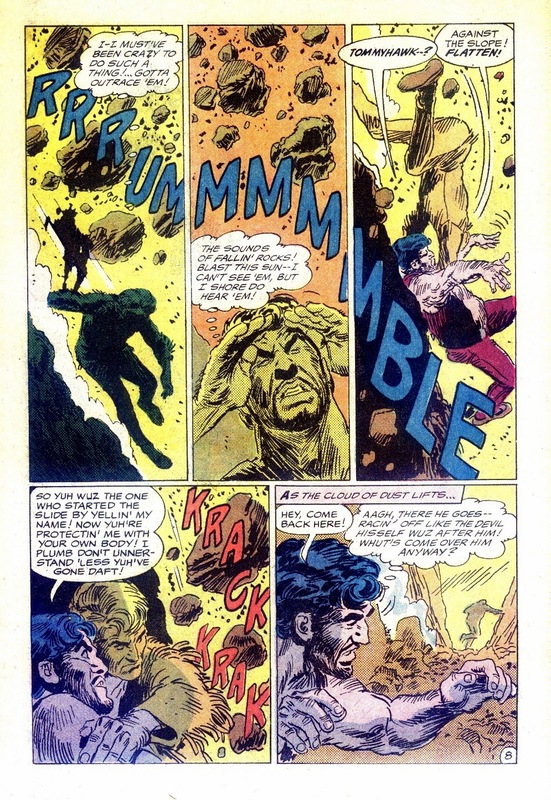 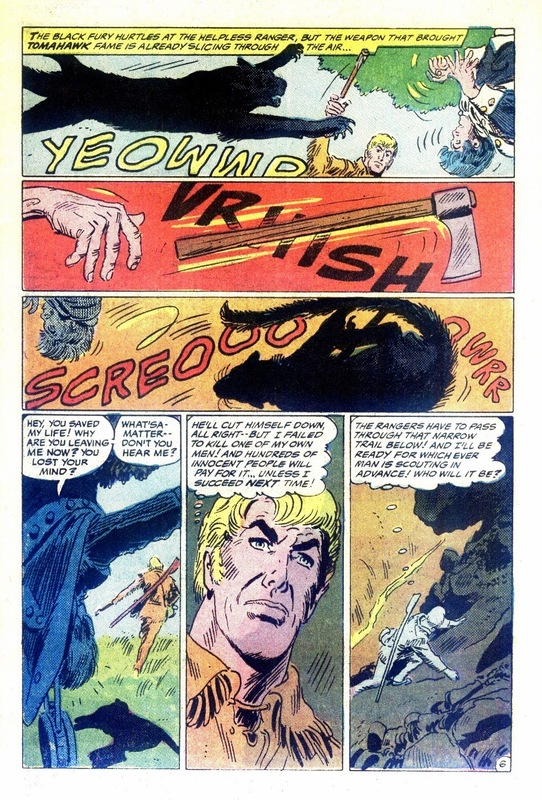 Davy himself starred in comics from many companies, including DC. 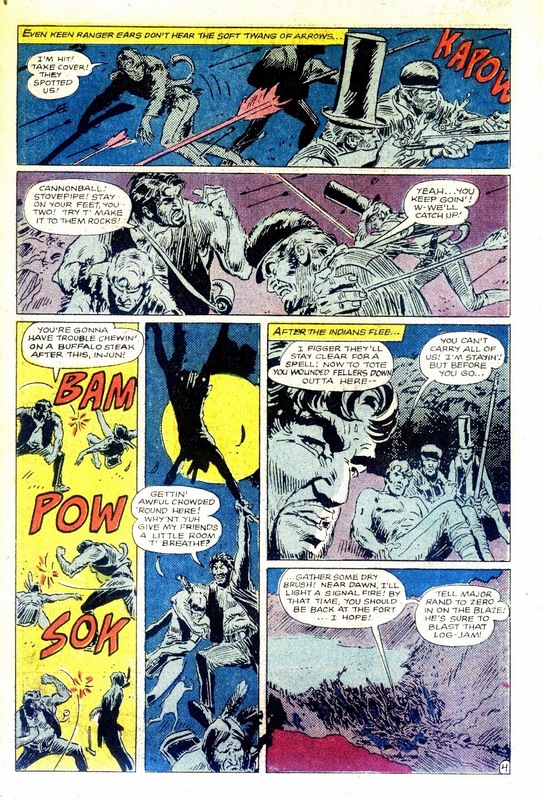 Popular culture was so different then; it's hard to imagine an historical figure being a hit these days in comics or on TV, unless they fight zombies or vampires. 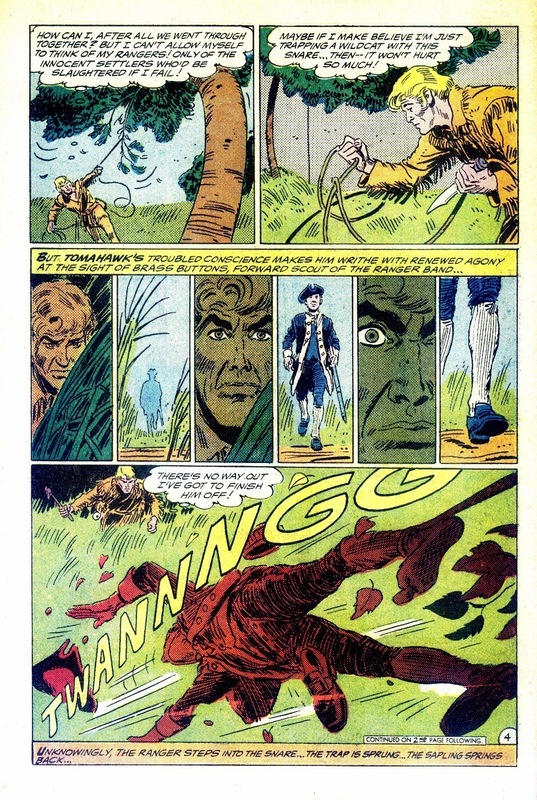 I agree those late Thorne issues were magnificent. 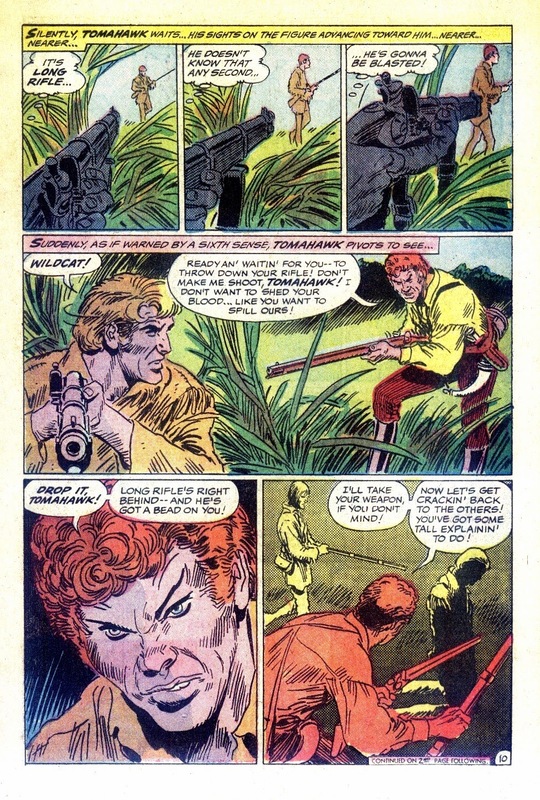 And the Neal Adams covers sometimes looked like images from the best adventure pulps. 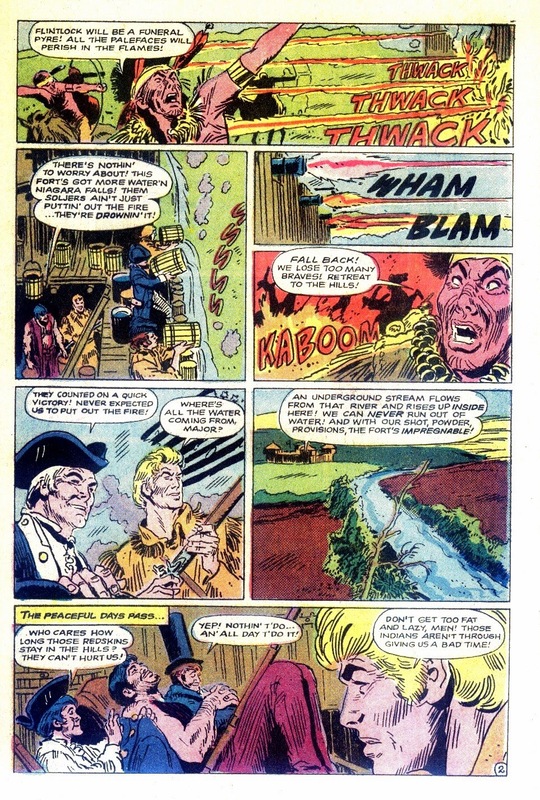 I'm thinking of one called "the Last Mile of Massacre Trail", though they were all great. 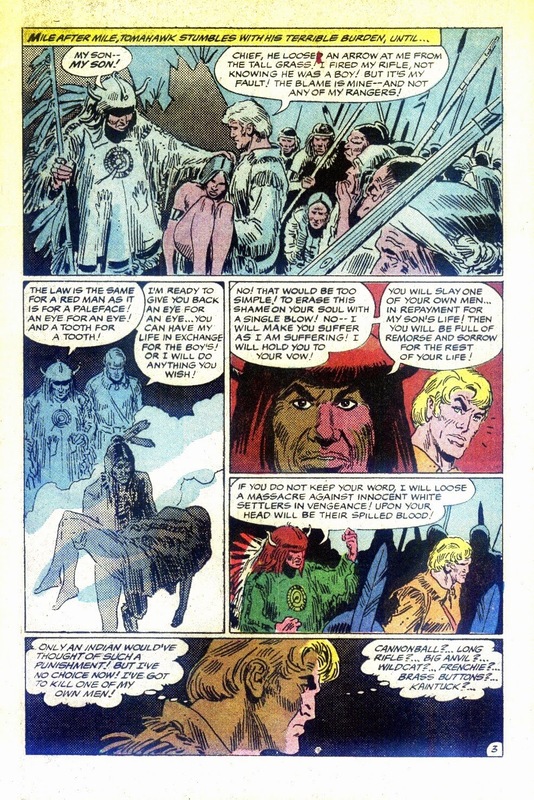 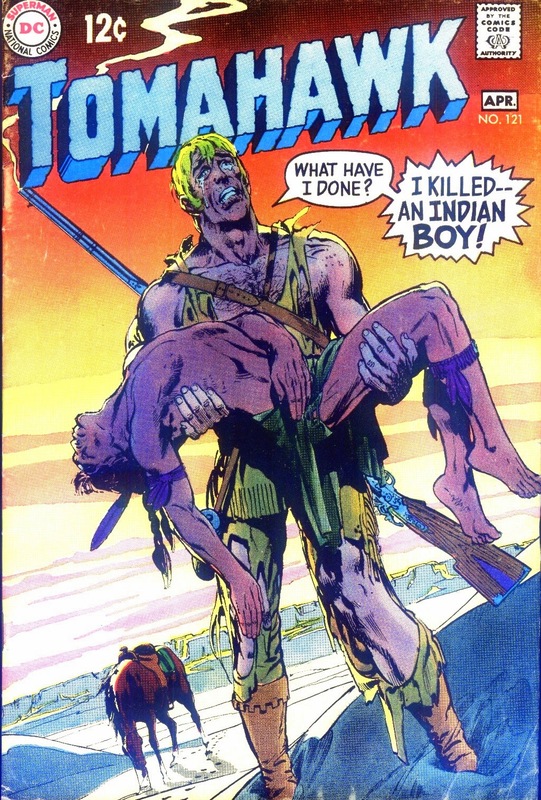 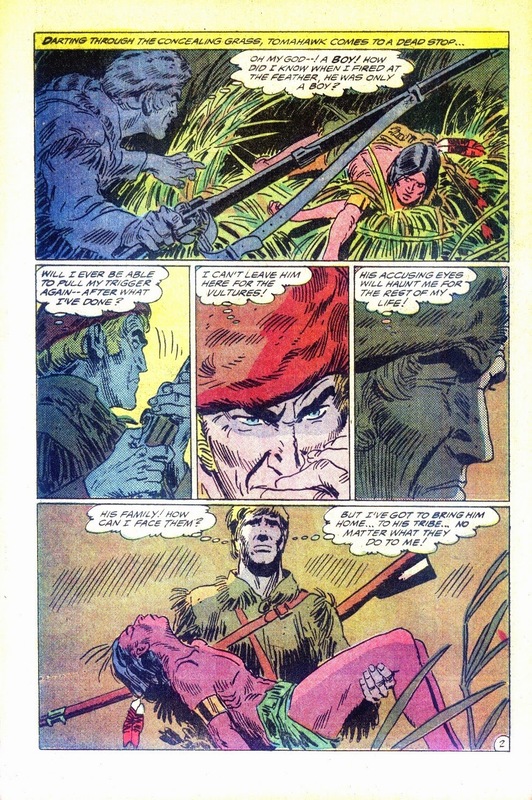 Near the end of the series, it became a proper Western about the Son of Tomahawk, edited by Joe Kubert, who did a few stunning back-ups of his character Firehair. 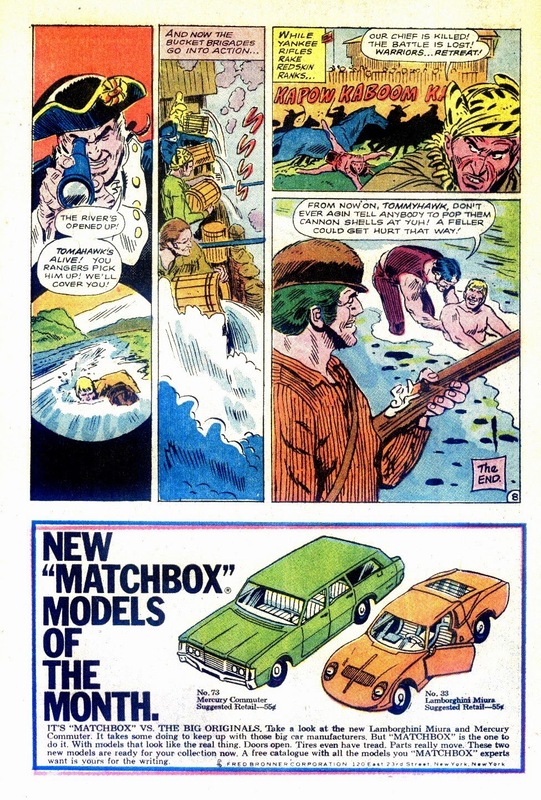 A very unusual, well-crafted series, I hope it will be collected someday.